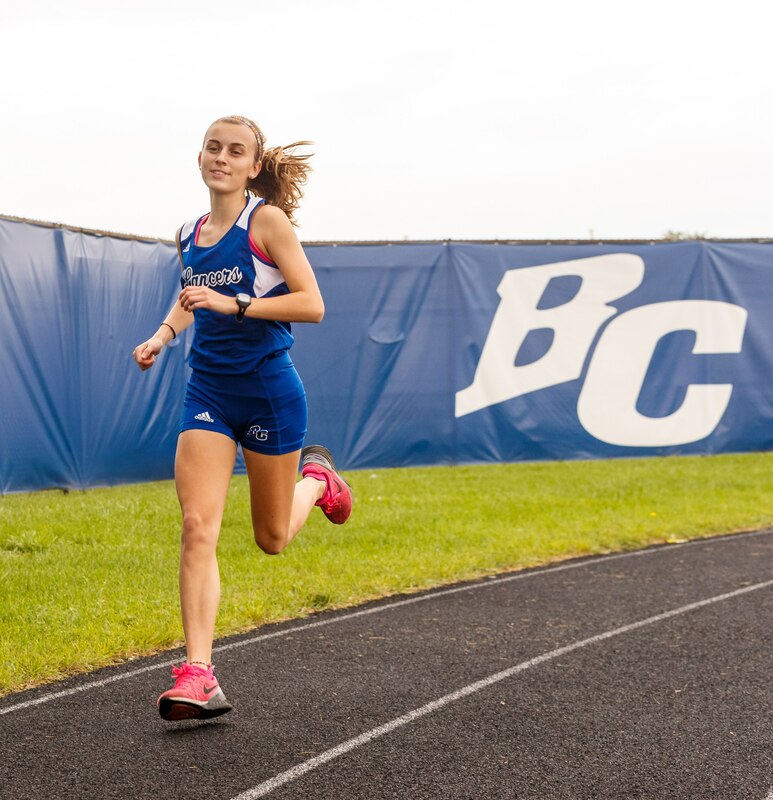 When Brookfield Central junior Leah Neustedter ran her first competitive cross country race in eighth grade, she was not expecting much. But when it was over, she certainly had a change of attitude. "A friend and I decided that we would both join together," Leah recalled. "Neither of us had run before, so it was a 'if you do it, I'll do it sort of thing.' Didn't think too much of it. In middle school it's not that serious. "In my first race my goal was to get in the top 50 and I ended up getting eighth. I finished higher than I expected to be so I thought, 'Maybe I had a future in this.' So I decided to join in high school." She certainly made the right choice. Neustedter earned Greater Metro All-Conference honors as a freshman, finishing sixth in conference. 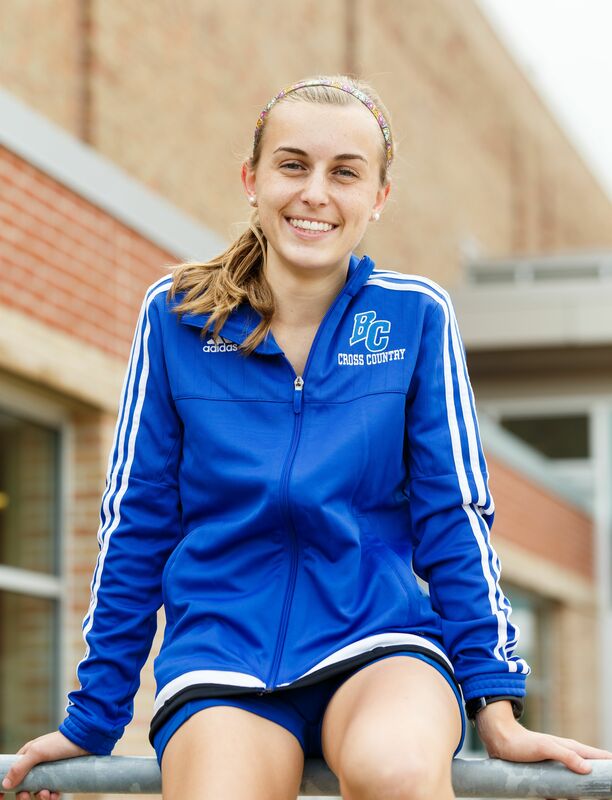 She qualified for the WIAA State Cross Country Meet, taking 13th place with a personal-best time of 19 minutes, 10 seconds and earned second team All-State honors. She finished fourth and earned all-conference honors as a sophomore, finished 19th at the state meet (19:19) and earned second team All-State once again. She was Central's Team Most Valuable Runner. She also excelled in the distance in track and field at state, taking seventh in the 1600-meter run (5:04) as a freshman, finishing fourth in the 1600 (5:00.73) and 12th in the 3200. The first 2-3 weeks of the season, I could see how she ran," Lewis said. "Her body-type. I knew that she would be good. (Freshman) Abby (Mauermann) had a lot of accolades coming in and she was our top runner, our most valuable runner. But then last year it was Leah." Having two talented runners like Neustedter and Mauermann both made them better according to Lewis and Leah. "The first half of her freshman year, it was evident that Leah and Abby would be able to run together," the veteran coach said. "They're very good friends and they train together. "They have a real good friendship with it and there is not a lot of competition between the two of them as far as who will beat who. They are connected with the friendship and it has benefited both of them that they were friends and can do it together." Mauermann missed her sophomore season with an injury and it hurt Leah's training program. "Abby was out for season and it was so hard because Leah had to work out on her own," Lewis said. "The fact that they have each other is beneficial to both of them." But Neustedter and Mauermann are back together again as juniors and it is going well. "Every workout this year Abby and I have been together," Leah said. "Definitely having someone next to you to run with you is so helpful. When she ran her freshman year, she didn't have anyone next to her and she had to push herself. When we're together we speak to each other and say 'You got this, keep going.' Having a teammate by your side for your workout who pushes you helps a bunch." But Leah emphasized, it was not a competition between the two of them. "It's a lot more encouragement," she said. "But then if we are in a race together we wouldn't hold back. We both would do what we had to do because we want to go for it." Leah talked about the difficulty of the sport. "I think it's a very challenging sport. All the kids who do it are of a different brand," she said. "It challenges you every day to be the best person you can be and push yourself a little harder and test the elements. "I didn't expect much at the very beginning. I worked hard (wanting to peak) toward the end of my season as my goal, being patient in races, putting that work into every workout. I wanted to be stronger at the end than I was at the beginning, I think that is a big strength." Leah recalled her first varsity race and how she learned about strategy the more she ran. "I don't go out hard at the beginning," she said. "I start in the middle and work my way up. My first varsity race I held back more. I wasn't sure how far toward the front I should be. Just hang back until you're feeling too comfortable and then move on; try and gain places." Neustedter said she needs to work on her second mile. "I'm pretty strong in the first mile, but in the second mile - a lot of runners, me included - grow weaker. Everyone has a lot of energy, but that last mile is always the hardest. I need to work on being stronger and having my split be as fast as my first mile." So what do you do to improve that second mile? "Mentally I have to tell myself I can go as fast in the second mile as I did the first one," Leah said. "Not slowing down, I need to push myself harder. I have endurance workouts, trying to have your miles be as fast for both the second and first." Leah feels attitude has a lot to do with improvement. "It's definitely very helpful. Before a race I try and keep my spirits up," she said. "I tell myself 'You're going to do great' - you just have to be positive for a race because I think negative thoughts will definitely affect your thoughts or your workouts. "I'm positive when I'm ahead. Even when I'm tired, I tell myself, 'Yes you can do this, get going' and that definitely helps me push myself." Being this year's top runners brings on pressure, but not early in the year according to Lewis and her top runner. "She started out the season as one of the top runners in the meets we have run," Lewis said. "Being the top runner is a great deal of pressure that many runners have trouble managing that. "She doesn't get caught up with who she is racing against. She's about running with what she has. She is very calm. She is managing the pressure, the expectations very, very well." It's how you start the season, not finish it according to Leah. "There's always a little bit of pressure, but I don't let that affect me," she said. "I don't think about it that much. There's more pressure once you get to the bigger meets like sectionals and state. Early in the season there is not that many expectations at this point. It's just going out there and running as hard as you can." Neustedter has a career personal best time of 19:10. She feels it is a realistic goal to break 19 minutes this year. "She still has untapped potential," Lewis pointed out. "The sky is the limit on where she can eventually go. As a coach I don't feel I have seen all the talent she has in her. That has come out. It's a part of learning run, of becoming a better runner for everybody. "She has a lot in her." FAVORITE FOOD: Broccoli and cheese soup. FAVORITE MUSIC/GROUP: Adele (Very empowering as a woman). FAVORITE CLASS: Computer (Visual Communication, Digital Imaging, Graphic Design. WHAT DO YOU DO TO RELAX? Listening to music, jump on trampoline. FAVORITE SPORTS RIVALRY/ATHLETE: Brookfield East, DSHA. MOST MEMORABLE SPORTS MOMENT: Placed second at sectional freshman year. WHAT WOULD YOU LIKE TO DO IN THE FUTURE? Go to college; may or may not run, depending on school.